LFG Specialties is the first company to dedicate its engineering and production facilities to the design and manufacture of landfill gas extraction, control and recovery equipment and systems. LFG Specialties manufactures a full range of enclosed type flares for landfill gas application. The flares are specifically designed for high-efficiency combustion of landfill gas, guaranteed to meet federal and state regulatory requirements for the disposal and combustion of landfill gas. LFG Specialities will also custom design and manufacture flares, controllers and combustor systems to meet specific customer conditions and specifications. 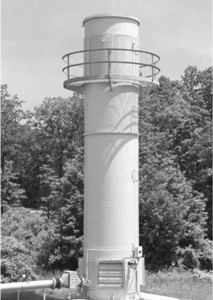 Flare Stack—Carbon steel construction with 150# flanged inlet connection. Combuster Assembly—All 304 SS burner tip. Peripheral Equipment—Flame arrester and pilot controls including: pressure regulator, gauges, fail-safe valves and manual shut-off valves. All of our flares are factory tested and shipped ready for quick installation and start-up.